Kidney disease is a condition also referred to as renal disease that occurs in rabbits. Renal disease is characterized by the inability of the kidneys to maintain normal function. Kidney failure is normally a result of poor husbandry and a diet high in calcium. Other causes such as severe trauma and stroke may lead to acute development of the disease. Any abnormality in the urinary system must receive immediate medical attention, as this can represent a life-threatening emergency. Many times inpatient care is necessary until the rabbit can properly urinate on its own. In the case of kidney disease, treatment options will vary depending on the underlying factor of the disease. The permanent effects of kidney disease will depend on an owner’s timely response to the symptoms as well as the ability of your veterinarian to restore proper urinary flow. A major step in preventing renal disease is to provide your rabbit with a diet that is low in calcium. The accumulation of calcium in the urinary system can lead to mineral deposits that hinder the function of the kidneys. Alfalfa hay, which is also used in the formulation of rabbit pellets, is high in calcium. Feeding your rabbit a high-quality grass or timothy hay will help prevent the ingestion of excess calcium. 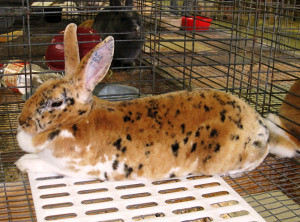 Rabbit owners should also practice good husbandry techniques. Providing rabbits with a continuous supply of fresh water will ensure proper fluid balance in the urinary system and help prevent a rabbit’s urine from becoming overly concentrated. Rabbits should also be kept in an area that is free from environmental threats that could cause extreme stress.